I get why people would want to create cups, glasses, and bowls using a pottery wheel. It’s an artistic thing and sort of a hobby for some folks. I don’t really get this concept device, which is sort of a futuristic, magical pottery wheel. Granted it has no wheel and you aren’t making pottery, rather you are making plates. Since the device is a concept, a good explanation of how it works is not needed. 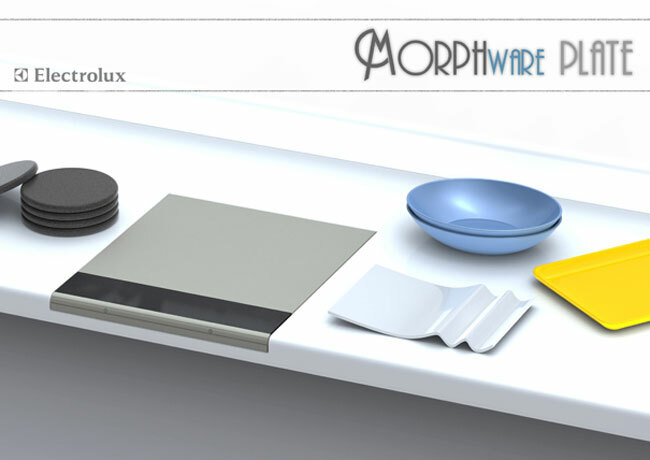 The idea is that you would place these gray blank discs on the Morph Plate. You could them look at an online catalog and download the design you want and the Morph Plate would make it real using the disk. The thing has some sort of liquid piezoelectric polymer according to the designer. The design can be removed from the disks for storage making them back into gray nothings again.